“Based on a true story” is a common preface to motion pictures. It’s your cue to assume that license has likely been taken with the narrative even though what you’re about to see, to some degree, is what real people have experienced in their lives. 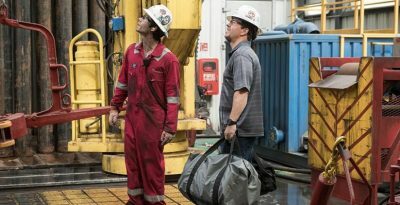 Cheerful humor and a sweet family-life atmosphere dominates most of the exposition of Deepwater Horizon, Peter Berg’s new film about a recent real life, multi-level tragedy. It may well be the script is even punched up some in later acts by the screenwriters, Matthew Mark Carnahan and Matthew Sand. 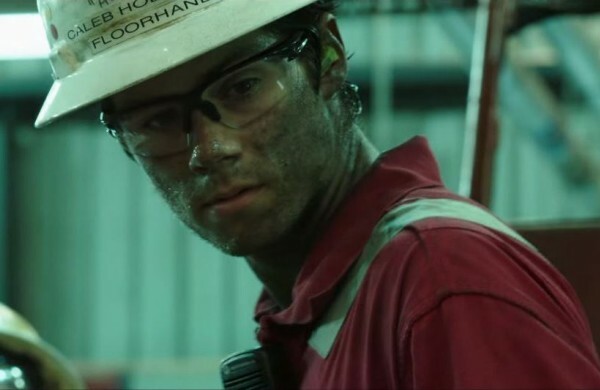 Nonetheless, Deepwater Horizon plays much like a dramatic, action-filled documentary about the British Petroleum/Transocean well blowout, fire ball, and nearly two-day inferno that contaminated a large portion of the Gulf of Mexico in the late spring and summer of 2010. It could be that it just seems documentary-like to me, since I clearly recall that polluted upchucking centered 43 miles off the Louisiana coast. Eleven Transocean employees were lost in the blowout, 17 were injured and, subsequently, the sea floor gusher propelled millions of gallons of oil into the Gulf: the largest environmental disaster in US history. BP agreed to pay $18.7 billion in fines for gross neglect and reckless conduct. However, the stretch of chaos that is the Deepwater Horizon blowout may be too much of one. In order to include the various personal experiences of peril confronted by the several characters, I felt the disaster sequence seemed inordinately long; that despite the effective techniques employed. Mark Wahlberg produced and has the lead in Deepwater Horizon. Wahlberg is seen as Mike Williams, a man who played an important part during the tragedy. Williams has since been in the media often — including “60 Minutes” — recounting his experience on the doomed rig. John Malkovich is well cast as the on-board British Petroleum employee who strongly lobbies the Transocean crew not to carry out a full schedule of tests to ensure the rig’s viability. Kurt Russell has the role of the on board Transocean boss who finally relents to the Malkovich character’s pressure. About halfway through the movie, be braced for another teeth-grinding shower scene of cinema, this time involving Russell. It’s almost as powerful and more sanguinary than Alfred Hitchcock’s Psycho moments with Janet Leigh… not long after she’s checked in at the Bates Motel. Back to the first act: family moments with Wahlberg as father, Kate Hudson as mother and their little daughter, played by Stella Allen, are special. I always get energized when seeing very young children playing the sweet scenes. Peter Berg really gave me a moment when Ms. Allen, playing the Williams daughter, is just being herself: striking moments always… in a well-directed motion picture like this.